Germany is still attractive to US companies. German firms are sending mixed signals to the USA. Germany and the USA are strong trading partners. If this is to remain the case, both countries need to start working more closely to create the basis for continued future growth. 2018 was a good year for US companies doing business in Germany and for German companies operating in the USA alike. 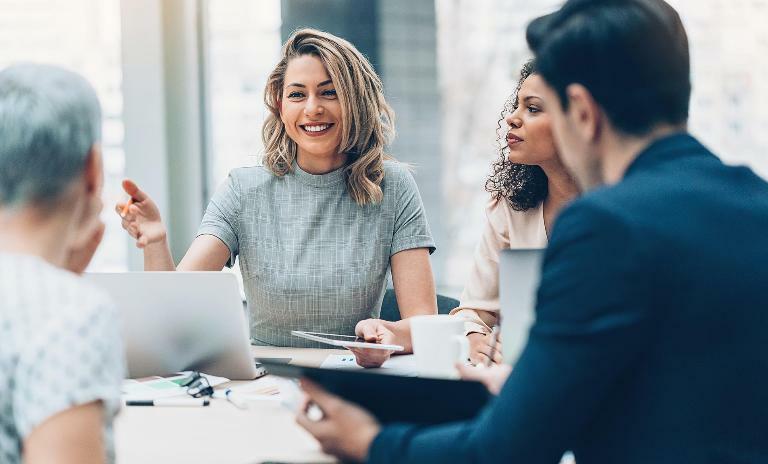 American firms in Germany are also full of confidence about 2019: 97 percent of companies plan to maintain the same level of business activity in Germany or even increase it. But the critical voices are getting louder – there is no guarantee that the two markets on either side of the Atlantic will remain attractive to each other for ever. There are too many uncertainties clouding the future outlook. 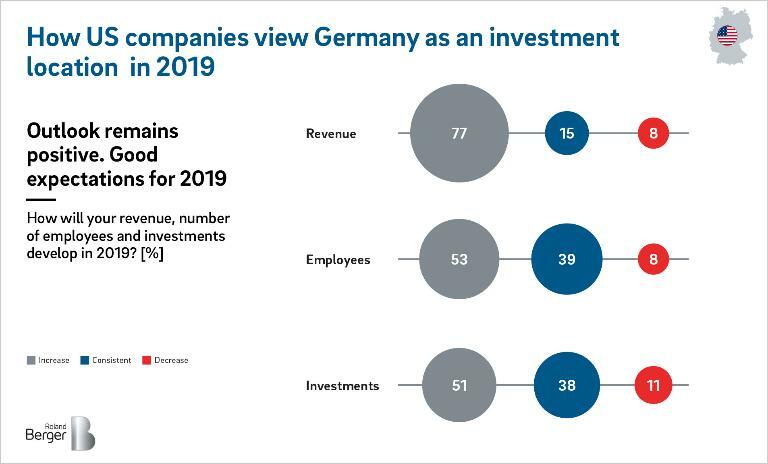 81 percent of US companies rate Germany as a good or very good business location, but nearly one quarter of firms think that investment conditions will deteriorate in the next three to four years. Added to that are the persistent problems of extremely high energy and labor costs and the poor quality of the digital infrastructure in Germany. 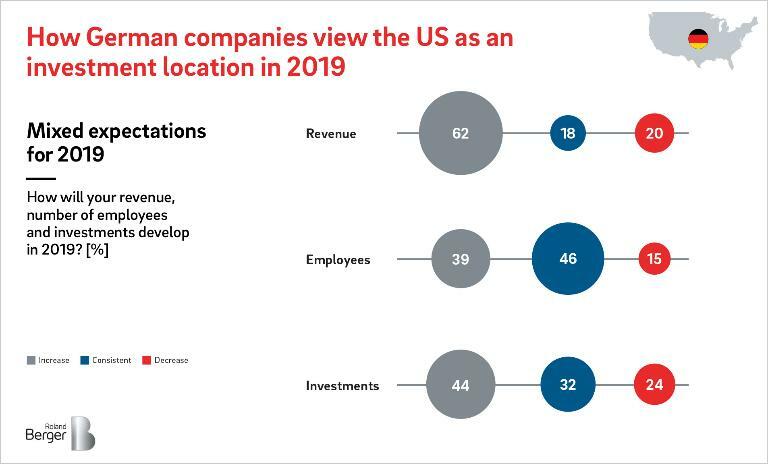 These are among the key findings of the AmCham Germany Transatlantic Business Barometer 2019, a study which Roland Berger publishes annually in conjunction with the American Chamber of Commerce. German companies with business operations in the United States are also experiencing growing levels of uncertainty, particularly as a result of tensions over transatlantic trade and the US government's tariff policy. After a year of strong sales in 2018, the majority of firms still expect revenues to rise further in 2019. But companies are less confident when it comes to employee numbers and capital spending. 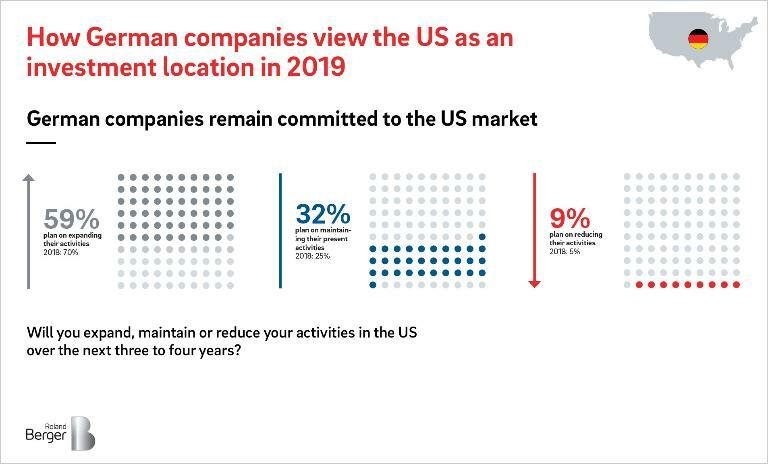 Survey respondents reported a perceived a decline in the reliability of US policy, with only 8 percent of companies rating US business policy as positive. 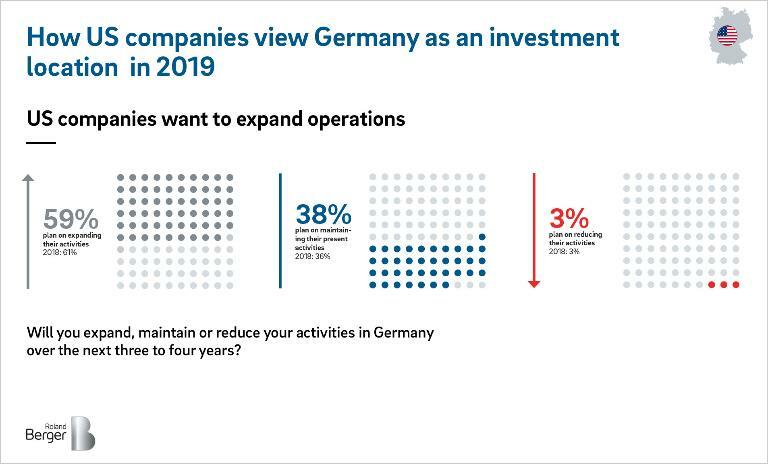 A full 37 percent of German companies expect the conditions for German firms doing business in the United States to worsen over the coming three to four years, a view reflected in companies' plans for the future. Whereas in 2018, 70 percent of firms were still planning to expand their activities in the USA, only 59 percent have plans to do so now. And 9 percent are even intending to scale back their business activity (2018: 5%). If both countries are to retain their status as attractive sales markets going forward, the right steps need to be taken – and not just at the national level: the state of transatlantic business needs to improve all round. There is work to be done on both sides of the Atlantic to achieve this: on the one side we need less protectionism, and on the other, the conditions for doing business must be improved, such as through consistent and comprehensive structural reforms.